Mister Maker: Watch & Make Vol. 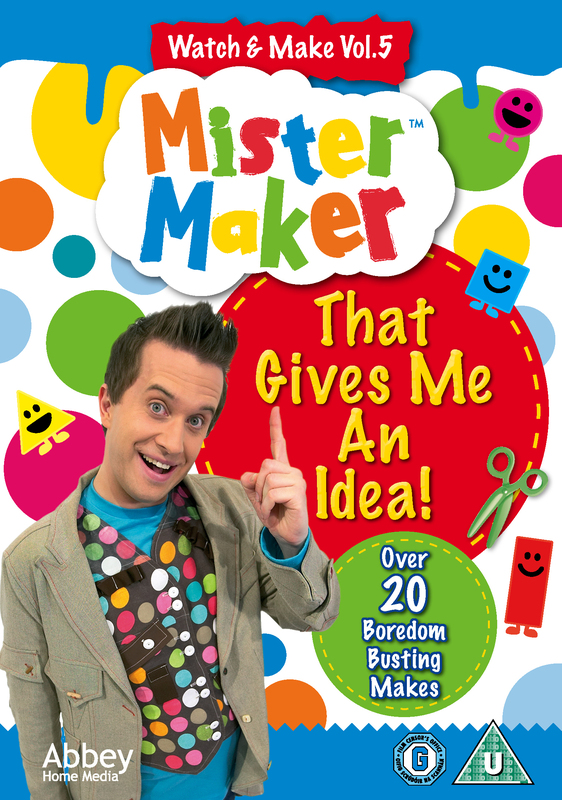 5 DVD is the latest collection of episodes from Mister Maker released by Abbey Home Media and hasn’t failed to disappoint. From a splattered space picture to bubble wrap pictures and crazy carnival shakers, this DVD is jam packed full of ideas and inspiration for little ones to not only to watch but to try and replicate at home themselves. 5yr old Miss M and 2yr old Mister B are always drawn in when Mister Maker comes on the tv and can’t wait to see what he makes out of the pile of crafty objects he gets prepared on his table. This DVD was no exception and they have watched it again and again. The first thing that Miss M spotted to make were straw powered rockets – a very simple one minute make within one of the episodes on this new DVD. It literally consisted of two rocket shaped pieces of paper stuck together around the edge with glue and then push a straw up between the two pieces. The novelty with this was that if you blow through the straw, the rocket blasts off into the sky!! Miss M kindly made Mister B a rocket too and the pair of them had much excitement blasting their rockets off around the front room keeping them occupied for the rest of the afternoon. We really enjoyed this DVD, have watched it over and over already and even made a couple of things therefore thoroughly recommend it for pre school crafty fun! The DVD is out now and can be purchased from all good DVD stockists. For more information about Abbey Home Media can be found on their website or Facebook and Twitter pages. This entry was posted in Reviews and tagged CBeebies, craft ideas, crafts, DVD, Mister Maker, pre school, review, rockets by Fiona Martin. Bookmark the permalink.